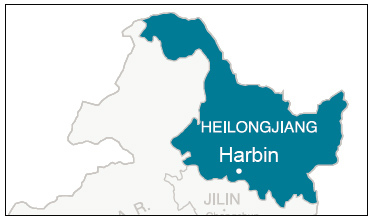 Harbin, the capital of Heilongjiang Province, is situated in the northeast of China. It contains many major manufacturing industries but mainly relies on the tourism industry for business due to its distinctive Russian architectural style and annual Ice Sculpture Festival. Due to its close proximity to Russia, many Russian immigrants made Harbin their home inthe early 20th century. Since the 1950s it has become a hub for mining and steel production. The Harbin Taiping International Airport is 35 kilometers from downtown Harbin. It provides services for both domestic and international flights to and from the major cities in China as well as destinations such as the United States, Russia and Malaysia. Due to its severe winter climate, Harbin’s inland port is only open from mid-April to early November. Passenger ships sail to and from Qiqihar, Tongjiang and Jiamusi in Heilongjiang Province as well as to and from Khabarovsk in Russia. Harbin has two railway stationswith the main station for passengers beingHarbin Railway Stationbecause itconnects five different lines: Jingha, Binzhou, Binsui, Binbei and Labin.The other major station isEastern Railway Station which is mainly for freight. Harbin is strategically placed and is therefore used as a transport hub not only in linking other towns and cities in China but also in providing transport to Russia. To this end, seven main routes go through Harbin such as Heihe-Dalian, Manzhouli-Suifen River as well as highways to Beijing, Changchun and to Tong River. Harbin’s subway system currently only has one line (line 1) but more lines are under construction. It is the first city in China to use cold resistant trains that can operate in automatic at temperatures down to -38°C. The city is known as the capital of power manufacturing due to its high usage of hydro and thermal power. Consequently, the Harbin Power Equipment Group Company is one of Harbin’s major enterprises. The Harbin Trade and Economic Fair is held annually with the 25th one having been held this year. 1,900,000 people from 80 different countries have taken part since the first event in 1990. Set up in June 1991 and approved by the State Council in April 1993, the Harbin Economic and Technological Development zone covered an area of about 13km2. It was divided into two sections: the Haping Road section which was about 11km2 and the Nangang area of 1.6km2. By 2001, investment was around one billion US dollars with over 400 investors from 30 different countries and regions investing in the zone. Business in the zone mainly focused on pharmaceuticals and electronics. Set up in September 1988 and approved by the State Council in March 1991, the Harbin High-tech Park covered an area of 23.9km2. By 2002, foreign capital was over 200,000,000 USD. It was centered around high-tech business products and production. In November 2001, the Harbin High-Tech Park and the Harbin Economic and Technological Development Zone merged into one zone (Harbin Development Zone). This was separated into three main areas – Nangang, Haping Road and Yingbin Road. The key industries operating out of this newly formed development zone were the automobile, auto parts, food processing and pharmaceutical industry. Notable pharmaceutical companies included Harbin Pharm and food processing companies included Uni- President, CJ and Associated British Foods. By the end of the year, 581 foreign-invested enterprises from 32 different countries and regions had been set up there with a foreign investment of 1.2 billion USD. Due to Harbin’s proximity to Russia, a Sino-Russian Cooperation Bureau was set up in the Development Zone and Sino-Russian enterprises had a combined capital of about 230 million RMB. However, on November 11, 2009 after a change in strategy, the Harbin Development Zone was divided once again into two sections – the Harbin Economic and Technological Development Zone (HETDZ) and the Harbin High-tech Park. The HETDZ now covers an area of 30.7 km2and the HHP an area of 23.9 km2. Notably, the Harbin Development Zone has connections with the Novasibirsk Science Institute Technological Park in Russia.